TORONTO (Apr. 14) — Though Thursday night’s playoff opener at TD Garden was as lop–sided as the 5–1 final score indicated, the Boston Bruins have merely accomplished half their goal. Only a sweep of the first two matches on home ice will enable the Bruins to control this best–of–seven series against the Maple Leafs. Should the visitors bounce back tonight from the Game 1 fiasco, their outlook changes dramatically. And, the reason is simple: After years of lethargy and excuses, the Leafs learned how to avail themselves of the Air Canada Centre. Perhaps this was a fond farewell to the company whose name has adorned the arena since it opened in February 1999. On July 1 of this summer, as the National Hockey League focuses on the opening day of unrestricted free agency, Toronto’s NHL home will become Scotiabank Arena (for a paltry $800 million over the next 20 years). Or… perhaps the Maple Leafs finally recognized that they cannot and will not win the Stanley Cup by worrying that Ontario boys get excited to play nationally (or locally)–televised games in Toronto. Such has been the prime cover and alibi of the post–1967 era for deficiency on home ice; dating, of course, to Maple Leaf Gardens. Suddenly, and spectacularly, that immobilizing trend reversed itself in the second half of this season. The Leafs were a perfect 8–0–0 at the ACC in February (edging Boston, 4–3, on Feb. 24) and won a franchise–record 13 consecutive home games from Jan. 31 to Mar. 24. Imagine, therefore, the hope and enthusiasm around here should the Leafs rebound to win Game 2 of their playoff series tonight. Toronto posted a club–record 29 victories at home this season. Its 10 home losses (all in regulation time) were the fewest since way back in 1970–71, when the team went 24–9–6 at Maple Leaf Gardens, but 13–24–2 everywhere else. This club is far–more balanced, recording a 20–16–5 mark on the road. So, the Bruins cannot be satisfied with their 5–1 romp in Game 1. If the Leafs triumph tonight at TD Garden and gain mathematical home–ice advantage in this series, it could represent a major turning point. Of course, I’m not suggesting the Bruins are incapable of winning on the road; far from it, given their 22–12–7 mark during the regular schedule. Rather, I figure the Leafs — 7–1–0 against Boston the past two seasons and uber–confident on home ice — will make it extremely difficult for the Bruins to advance beyond the opening round… should they even the series tonight. That seems like a pipe–dream after Game 1, but the Leafs have shown good resilience under Mike Babcock. It was just more than three weeks ago, you may recall, that the club fell apart at Tampa in the third period and lost, 4–3. But, the following night came arguably Toronto’s signature win of the season: a 5–2 rout of the Nashville Predators at Bridgestone Arena. The answer tonight is no different than prior to Game 1. Just more urgent. 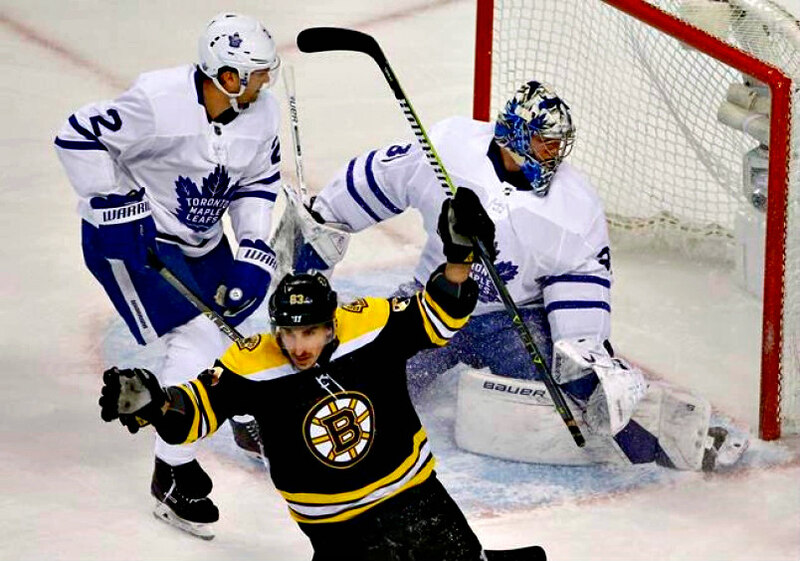 Toronto’s elite forwards (Auston Matthews, Mitch Marner, William Nylander, James van Riemsdyk and Patrick Marleau; now five with Nazem Kadri suspended) must find a way to surmount Boston’s big three stoppers: Brad Marchand, Patrice Bergeron and Zdeno Chara. That tussle was no contest in Game 1 with the key visitors silent. And, should it continue tonight, Boston will grab a likely–insurmountable lead in the Atlantic Division semifinal. But, do not underestimate the 105–point Maple Leafs, a lofty 23–8–2 in their final 33 games of the regular season. Losing Kadri could be a blow… or a blessing–in–disguise, given how he performed on Thursday with Boston getting under his skin. And, without question, Frederik Andersen cannot allow another five pucks to elude him. Even if the goals in Game 1 were “clean”, the Maple Leafs’ No. 1 stopper has to be better than every other player on the Garden ice tonight. If not, the Bruins will come north with a 2–0 series lead. 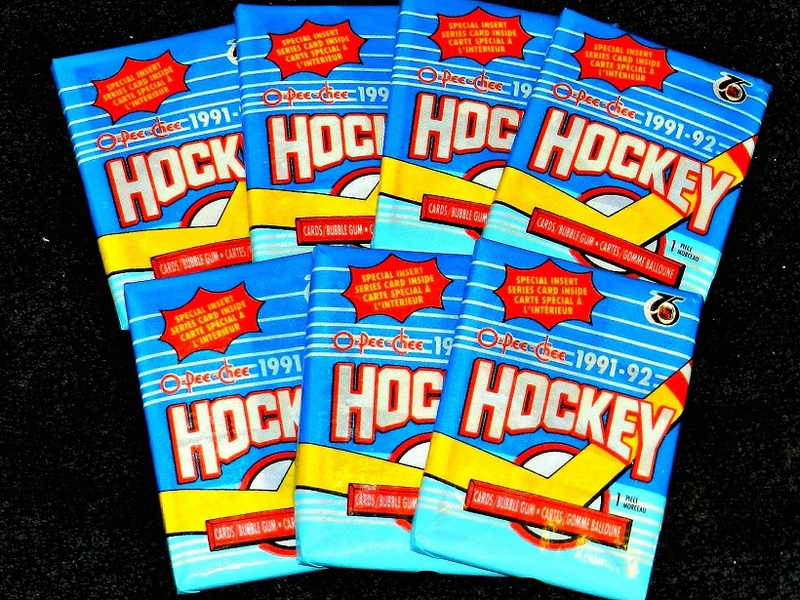 CARDBOARD BOX (ABOVE) AND UNOPENED PACKS (BELOW) FROM THE O–PEE–CHEE 1990–91 NHL HOCKEY CARD SET. 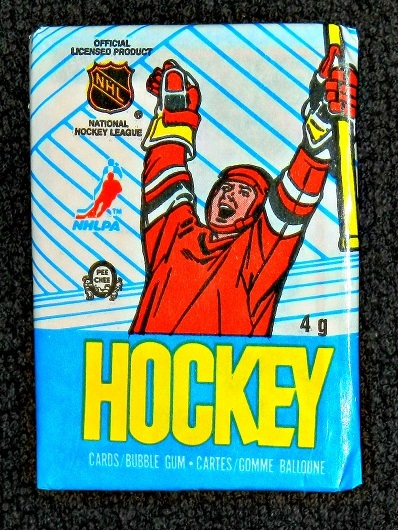 YES, THE STICKS OF BUBBLEGUM ARE STILL INSIDE THE PACKS. 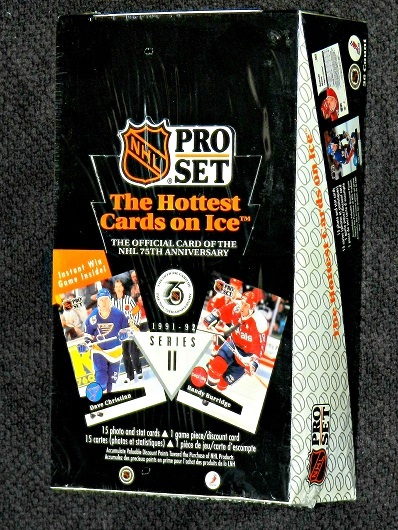 CARDBOARD BOX (ABOVE) AND UNOPENED PACKS (BELOW) FROM THE 1991–92 O–PEE–CHEE SET. THE BOWMAN GUM COMPANY BEGAN PRODUCING SPORTS TRADING CARDS IN 1948. 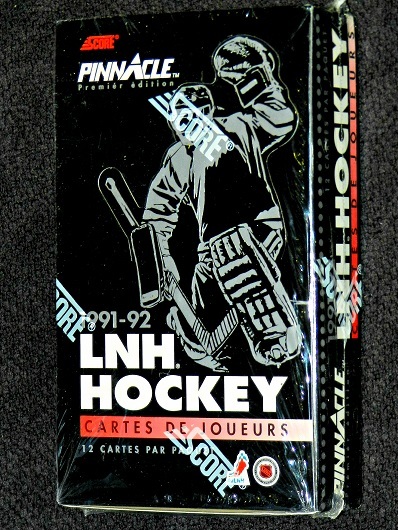 ITS INAUGURAL VENTURE INTO HOCKEY OCCURRED (ABOVE) IN 1990–91. 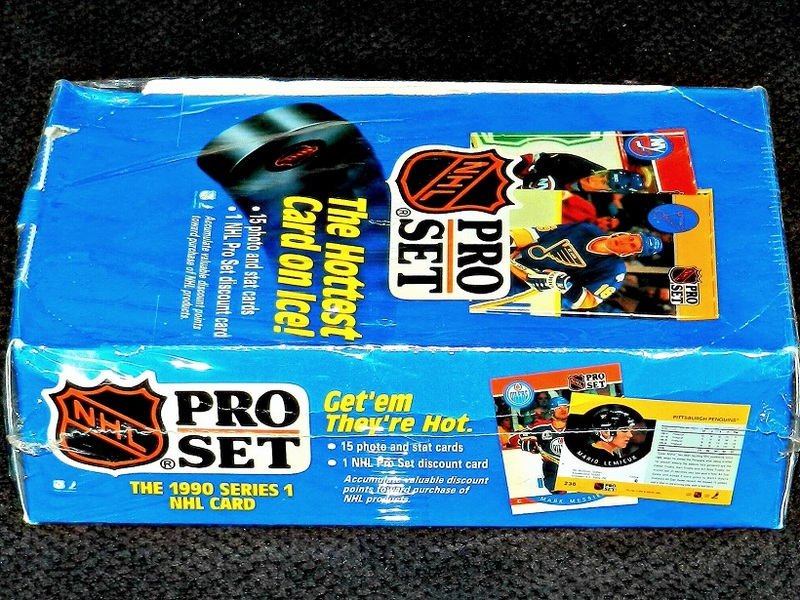 PRO SET WAS A DALLAS–BASED COMPANY, FOUNDED IN 1988 AND THE “OFFICIAL CARD OF THE NFL”. 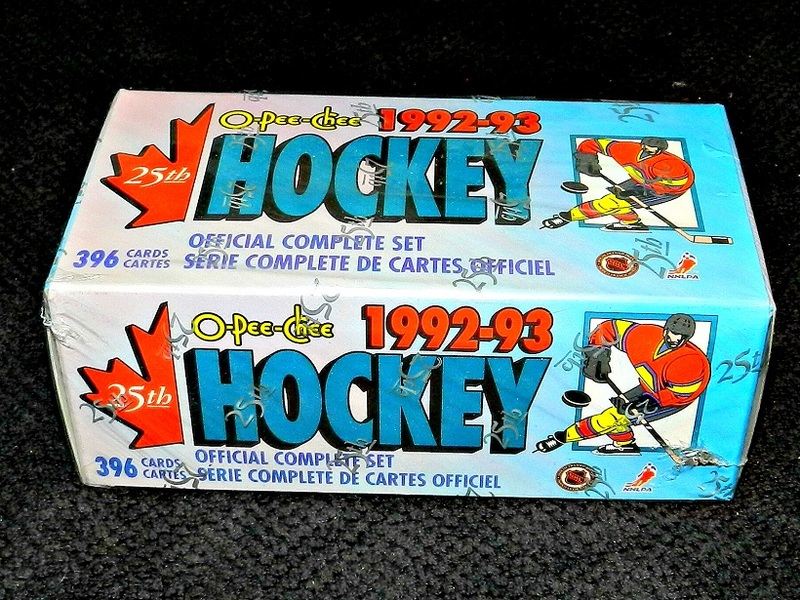 IT PRODUCED TWO SEASONS OF HOCKEY SETS: 1990–91 (ABOVE) AND 1991–92. 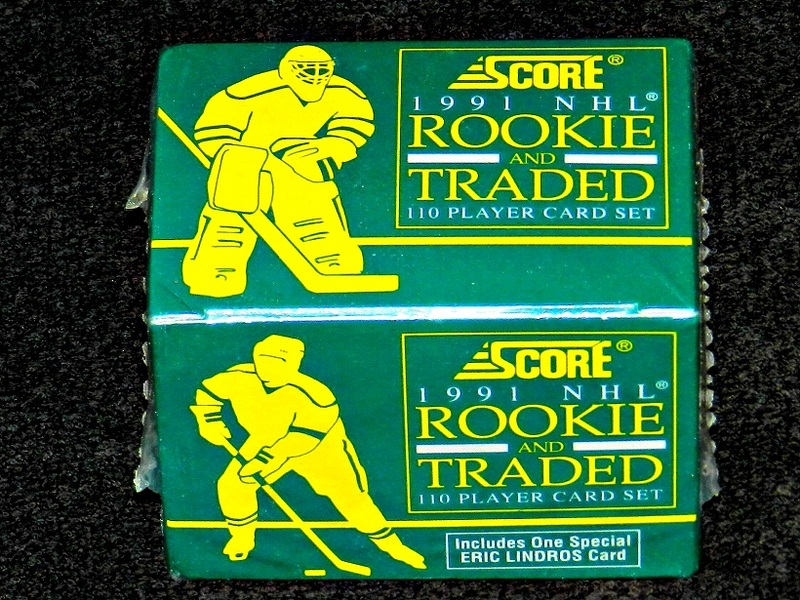 THE 1991–92 ROOKIE AND TRADED BOX SET, ISSUED BY SCORE. 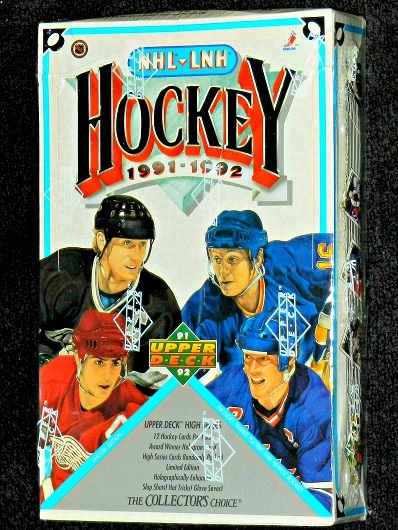 ABOVE: 1991–92 UNOPENED BOXES. 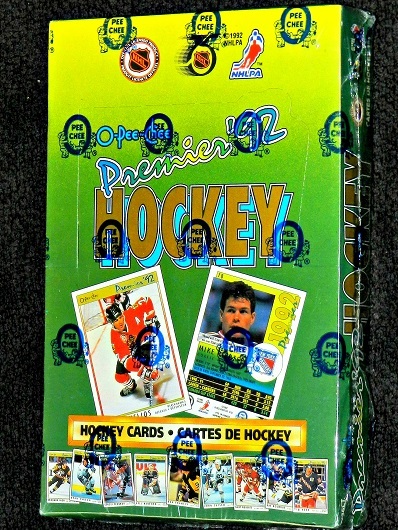 O–PEE–CHEE PREMIER (LEFT). SCORE NHL (RIGHT). 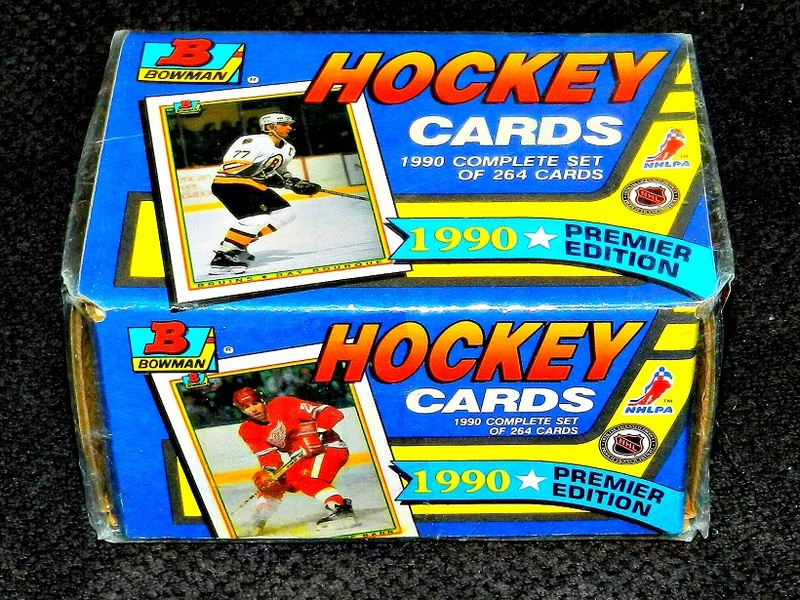 ALSO FROM THE 1991–92 SEASON (BELOW): UPPER DECK (LEFT) AND PRO SET (RIGHT). THE OLD CANADIAN STAPLE SINCE 1968–69: O–PEE–CHEE. 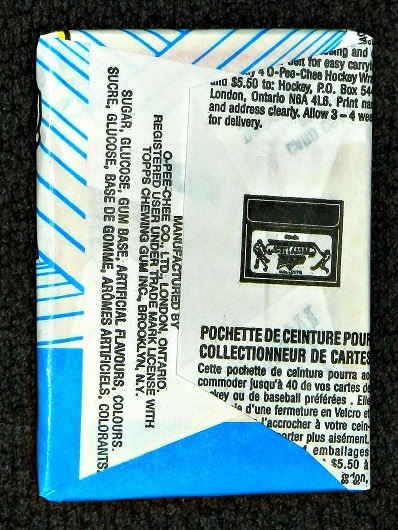 THIS SEALED BOX FROM 1992–93. 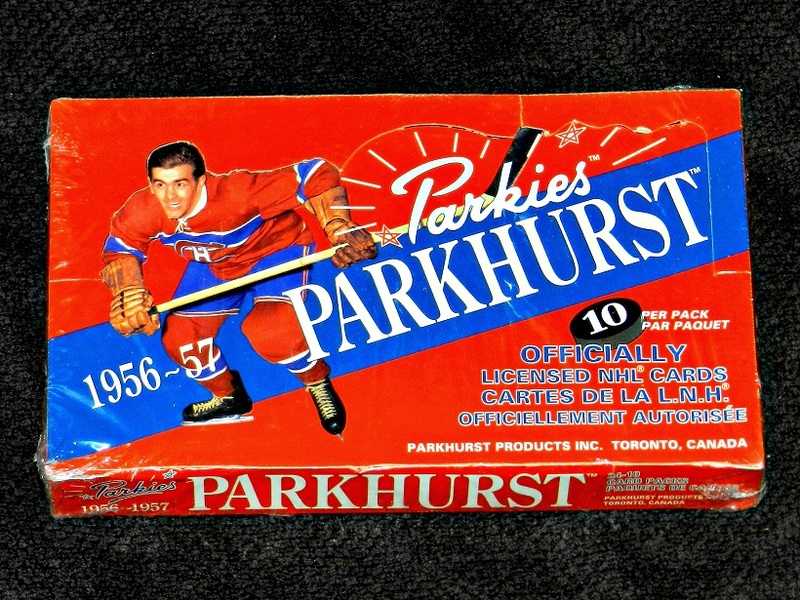 IN 1994, PARKHURST RE–ISSUED A BOX OF ITS NHL CARDS FROM THE 1956–57 SEASON. When Upper Deck etc started showing up I knew the glory days of card collecting and inflated value would end. 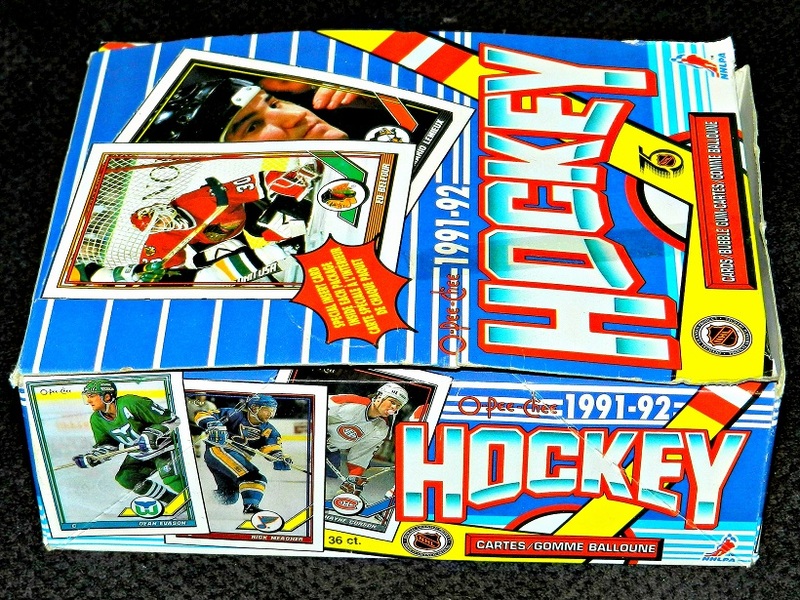 You where smart to focus on Topps and Opee Chee Howard. 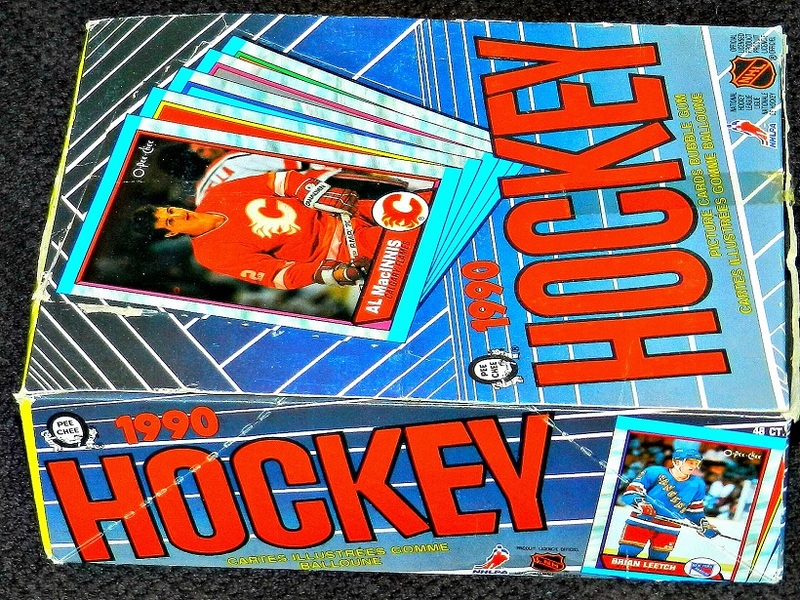 I remember in 1979/80 when my neighbour Joey gave me a hockey card and told me to keep it in a safe place. “It’ll be worth something someday.” He already had 11 of them. 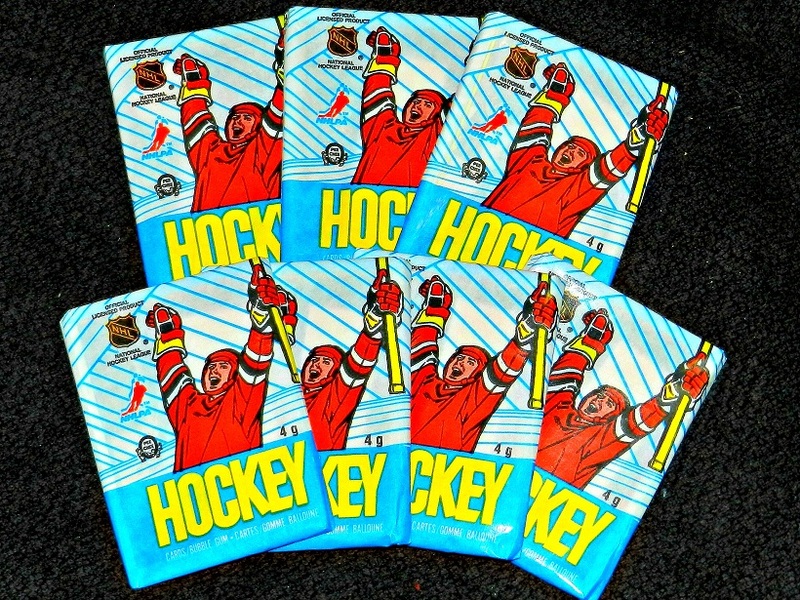 It was a Gretzky rookie card and last time I asked him, in about 2004, he still had EVERY one of them. I sold mine in 1993 for $585 in order to go on a camping trip. I already a tent, supplies and the campsite was $12 a day so you can surmise what most of the money was spent on. Hey, I was 22 at the time.